Through the combination of CT scans and archaeological research, the display of a four-metre long mummified crocodile introduces visitors to the beliefs of ancient Egyptians, to whom this mummy was an incarnation of the crocodile god Sobek. For many people crocodiles represent the ultimate predator, a merciless killer which hides in the water to prey on whatever comes to drink water or to cross rivers. Probably the most well-known crocodile habitat is the Nile, where these animals dwell in great numbers and sometimes attack people. In ancient times, however, crocodiles were regarded as more complex than simply vicious carnivores, as the current Asahi Shimbun Display, Scanning Sobek: mummy of the crocodile god, in Room 3 demonstrates. 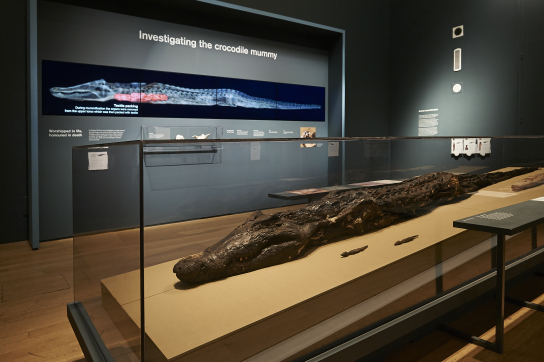 Through the combination of CT scans and archaeological research, the display of this four-metre long crocodile introduces visitors to the beliefs of ancient Egyptians, to whom this mummy was an incarnation of the crocodile god Sobek. Although crocodiles were considered terrifying beings to be placated through offerings and gifts, they were also associated with the fertility of the river Nile and its annual flood, which was fundamental to the wellbeing of the country. It is difficult to imagine crocodiles without an abundance of water, and therefore the Sahara Desert is one of the last places one would think of as a crocodile habitat. Astonishingly, even today there are several areas in the southern Sahara where small groups of crocodiles still endure the harsh conditions of semi-desert zones, and survive in caves, pockets of water and other permanent water sources. Although until the 20th century crocodiles were still found in some areas of Morocco and the Tassili n’Ajjer massif in Algeria, nowadays northern African crocodiles are mostly found in Mauritania and Chad. The situation was very different ten thousand years ago. At that moment the Sahara, now the largest non-polar desert on earth, was a savannah crossed by networks of rivers. Species such as hippopotamus, elephant and giraffe lived near the shores of mega lakes. Throughout the desert, archaeologists and palaeontologists have documented skeletons of crocodiles in areas as unlikely as Algeria, Libya and northern Mali, proving that crocodiles roamed in a greener Sahara thousands of years ago. Although most of the information about the presence of crocodiles in the Sahara derives from bones, there is another source of information to record the presence of these animals in the desert: the depictions of crocodiles in the Saharan rock art. The best known example is this striking engraving located in the Messak Setaffet, a stony plateau located in the south of Libya with numerous dry riverbeds running to the east into Murzuq erg. These riverbeds are home to some of the oldest rock art depictions in the Sahara, many of them representing animals long since disappeared from the region. Measuring more than two meters in length the crocodile depicted is accompanied by a hatchling and a cow engraved under one of its forelegs. The meticulous engraving technique, the size of the images and the carefully chosen boulder make this figure one of the most iconic rock art depictions in the Sahara. This is one of my favourite images of the African Rock Art Image Project, so when the project team investigated which rock art sites could be digitally recreated; the Messak crocodiles were the first to come to my mind. The results of this work provide an alternative view of some of the most remarkable features of these figures, and reflect the skill and dedication of the artist who used the boulder to enhance the shape of the animal. A month ago, this 3D model was printed (at a smaller scale) and now we have a small version of a 10,000-year-old engraving, a beautiful example of a world long vanished, but an important didactic tool, too. As a digital-only project, one of the challenges we face is to make people see our images as material expressions of the past, and 3D printing provides a link between the original piece and the contemporary public. Though impressive, the crocodile image isn’t just a piece of art, it’s also a cultural expression of Saharan communities thousands of years ago, and a testimony of the environmental conditions in which they lived. The Asahi Shimbun Display in Room 3 and the 3D reconstructions carried out by the African Rock Art Image Project are good examples of how new technologies and archaeological research can be combined to improve our understanding of past societies, and present this knowledge to the public. 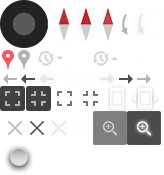 They also bring to light the delicate balance between environment and culture in ancient societies, and the multiples strategies humans used to incorporate the world that surrounded them in their identities and beliefs systems. For more information about the project, please visit our project pages on the British Museum website: britishmuseum.org/africanrockart.